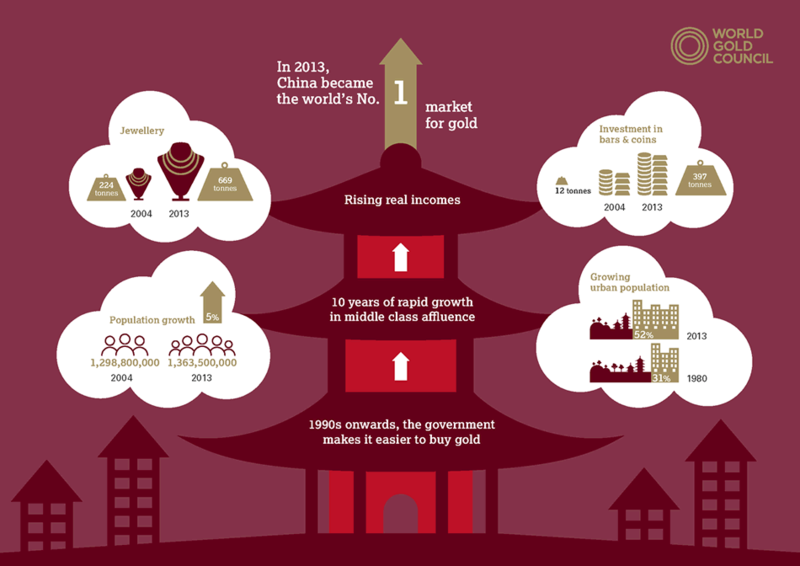 The Chinese have always been in love with gold. And this year especially, China is taking several steps to rattle gold markets. The country is currently lobbying to be included in the International Monetary Fund’s reserve currency, and gold has a lot to do with that process. Estimates say China has amassed thousands of tons of gold reserves that could rival the United States in the future. “It is the Chinese view that all great currencies have gained prominence in some measure because of the hard asset reserves the government standing behind the currency holds. Gold reserves both from the government and reserves held by the population are a key factor for economic security for them,” says Simon Mikhailovich, managing director at Tocqueville Bullion Reserve. In its quest to increase both private and public holdings, the country has overtaken South Africa as the world’s largest gold producer, and by 2013 has become the world’s biggest private market for gold, according to the World Gold Council. Investors and consumers bought 259 metric tons (tonnes) of gold in 2013 as mines produced 430 tonnes. But that is not enough: According to the chairman of the Shanghai Gold Exchange (SGE), Xu Luode, China also imported 1,540 tonnes through Hong Kong. The paper market doesn’t count here. It knocks the market down. 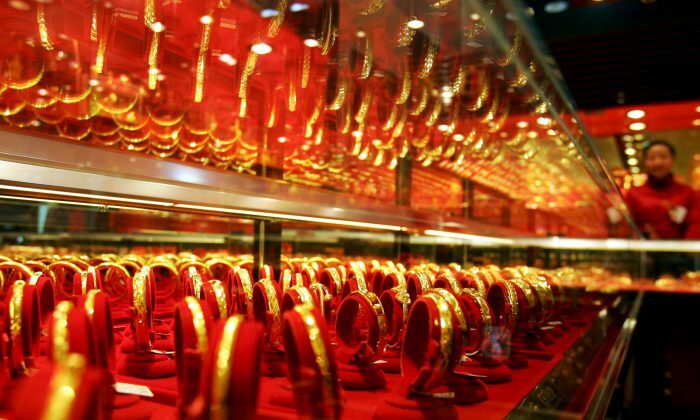 It is the very same Shanghai Gold Exchange that is now taking another step toward controlling the gold market. According to Reuters, China plans to establish a new standard gold price for physical metal, a so-called fixing for the 1-kilogram bars (32.15 troy ounces) it trades on its futures exchange. Both Chinese and Western banks have been involved in the fixing, which has not yet been publicized. However, it is a logical step in China’s quest to gain more influence. Dissatisfied with the current gold price fixing conducted by member banks of the London Bullion Market Association (LBMA), China can achieve several goals by starting its own mechanism. “I think the Chinese have a problem. The LBMA auction price is achieved by a group of banks. Price for physical gold is determined in markets where you don’t have to have physical gold to affect the price. You don’t even have to want it, you can just do it through financial operations,” says Mikhailovich. Setting prices this way lacks transparency and leads to distortions in the market. He refers to the fact that “paper” derivative contracts far exceed the amount of physical gold available for trading. According to a report by the Reserve Bank of India, paper claims on physical gold were 92:1 in 2010. At this moment, there are two fixings for the price of physical gold—at 10:30 a.m. and 3 p.m. GMT in London. The member banks set a price, which settles delivery contracts among themselves through a secret conference call. This price then acts as a signal for pretty much all gold derivative contracts such as futures and options throughout the world. The current participants in the fixing are Barclays, HSBC, Scotia-Mocatta, and Societe Generale. In addition, there is evidence that this “paper” gold price has been manipulated downward. “There is no transparency and there has been evidence of tactical manipulation. Who says there is not strategic manipulation?” asks Mikhailovich. This was beneficial for China for some time, as it enabled it to accumulate gold at discounted prices. But not anymore. As part of its bid to gain more influence at the International Monetary Fund, China will likely come out with an updated number of its gold reserves, which stood at a paltry 1,054 tonnes as of 2009. “I am convinced they will announce the new number in the summer, prior to the decision of the IMF regarding the SDR. We have always seen that gold is a very important factor when it comes to trust in a currency. I think a gold backing of the yuan would substantially increase the international acceptance,” says Ronald Stöferle , managing director at European asset manager Incrementum. What is even better than just showing a higher number of tonnes in reserve, is also showing a higher price. “I think what the Chinese are trying to do is creating a real market that reflects supply and demand for physical gold,” says Mikhailovich. Because of the skewed relationship between paper and physical, this will very likely also lead to higher prices for physical, bypassing the futures trading on the New York Futures Exchange Comex and the obscure price setting mechanism at the LBMA. “Both gold and silver are very actively traded in the derivatives market. Every other asset that doesn’t have a derivative has gone up in price,” he says, and makes reference to collectibles, such as paintings and antiques. Indeed, after the gold price topped out at the end of 2011, an index of global art compiled by artprice.com has risen 9 percent until August of 2014. Having a vibrant physical market would also help from a technical perspective as the exchange would hold the physical inventory while it goes up in price, rather than paper gold, according to Victor Sperandeo of EAM Partners LLC.